By now I hope you know that my recipe posting philosophy is pretty simple: I only post recipes that are the best of the best. Be assured that for every recipe that makes it here, there are at least five or six I’ve made that just don’t make the cut. Brian has this look he gives me when we are eating dinner and I know that he knows that I need to know that the recipe probably isn’t worthy of the blog and most definitely should not go into our personal meal rotation (but bless his heart, that man eats whatever I put in front of him, good or bad). Usually The Look is accompanied by whining children and/or gagging. I’m nothing if not adept at picking up on subtle cues like that. But even with my posting philosophy firmly in place, I still wondered if I should share this one. Don’t worry, it didn’t induce The Look or gagging (far from it). It’s just…well…not very exciting. Beef and barley. In the slow cooker. It kind of makes me sleepy just thinking about it. However, this soup’s homey, comforting flavors with basic ingredients are incredibly delicious and left me craving more. When I made it for the third time, I figured you might want it in your life, too. Plus, the slow cooker feature means you can fix it and forget it and that is never a bad thing. Ever since converting this fabulous Southwestern Chicken and Barley Chili to the slow cooker, I’ve fallen in love with barley even more. It’s nutty and soft but still slightly chewy, and in this soup, the tender bits of meat and carrot (reminiscent of the amazing, tasty carrots that come out of beef stew – my favorite part!) and the rich, hearty broth bring everything together perfectly. So yeah, this may not be the most trendy recipe on the internet but I can promise you, it isn’t because of flavor and taste. It’s just because those viral recipes have sprinkles on top and this doesn’t. Ok, now for the two new menu features! Starting today, I’ll be adding a What to Serve With This section for each main dish post (see below). Not to say you are forbidden to eat this soup without, say, a dinner roll, but it’s just a way to help you pair side dishes with main dishes. A little extra boost after the Side Dish Planner I introduced earlier this week. And 99% of the time, I’ll literally be telling you what we actually did eat with the featured recipe. I’m slowly working my way through the archives to add this feature to all the main dishes on my site, but for now look for it mostly on new posts. Finally, if you glance down there in the footer, you’ll see a Weekly Menu which will be updated with a new menu each and every week. I know you already have access to these downloadable menus, but this is meant to be a one-glance option for menu planning. And yeah…I think that’s it. Thanks for sticking with me. In a 12-inch nonstick skillet, heat the oil until rippling and hot over medium heat. Season the beef with salt and pepper and add to the skillet in a single layer (you may need to do this in batches), cooking for 1-2 minutes, browning on all sides. Repeat with the remaining meat if needed. Scoop the meat into the slow cooker, leaving as much oil/liquid behind in the skillet as possible. Return the skillet to medium heat and add the carrots, mushrooms, onion and garlic. Cook for 4-5 minutes until the carrots and mushrooms start to soften. Stir in the tomato paste and thyme and cook for 1-2 minutes. Whisk in the chicken broth and simmer for a minute or so. Pour the mixture into the slow cooker. Add the beef broth, soy sauce and barley. Give the soup a good stir and then cover the slow cooker and cook on low 7-9 hours. Season with salt and pepper to taste, if needed, before serving. I made it for my family last week and we loved it! Only suggestion was that maybe a little red wine could be added? My husband and I felt like the 1 teaspoon of dried thyme was really overpowering. Also, it was a little greasy for my taste. The neat was very tender. We love this one! Any idea on what the time would be in the instant pot? Thanks! If the meat was cut into small enough pieces (so the barley doesn’t overcook), I think you could try 15-18 minutes high pressure. Made this tonight and it was excellent. Loved the addition of tomato paste and soy sauce. I made my own beef stock by roasting beef bones and veggies in the oven then putting all in my crockpot with water to cover and cooked on low for over 12 hours. Stock was amazing in your Beef Barley soup. This was amazing! I got home today and my house smelled sooooo good!! And then dinner happened and my two girls, 6 and 3 ate two bowls each!!!! It was delicious! Thanks for the awesome recipe!! I have a left over cooked roast. Do you think I can just throw everything into the crock pot at once? Could definitely experiment and try – the flavor will probably be a bit different but it’s worth a try. Make some really good beef stock and you’ll be fine. Add your cooked beef towards the end of cooking process so it doesn’t dry out. This was so good on a chilly New England night! Another hit from Mel 🙂 I added a little red wine vinegar at the end but otherwise as written. how is this made on the stovetop? I made a double batch to freeze half in preparation for my baby to arrive soon. I had to make some changes since my slow cooker took a dump on me. I was short 3 cups of broth so I just used water. I added 4 or 5 small potatoes since they happened to be in the cupboard. I simmered the soup on the stove on low with the lid on for 2 hours and added the potatoes and barley for 1 more hour. It turned out PERFECT. The barley wasn’t over cooked, the broth is ridiculous. My family will love it and I think it will freeze great. I’ve made this three times now, and love it every. time. I am the only woman on earth who DOES NOT own an Instant Pot, so it goes in the Ol’ fashioned slow-cooker! This time I did not brown the meat, so we shall see how it goes! Thank you for sharing yet another amazing recipe! I love every “Mel” recipe I have tried over the years, I know that if it comes from Mel it’s going to be good. I love barley soups, especially beef and barley together. I made this and it was wonderful. A change I made was to take the tomato paste and put it in the bottom of the slow cooker on high while I cooked the meat. I added the beef broth before I put the meat in the slow cooker. I love caramelizing tomato paste with beef dishes. It just seems to deepen the tomato flavor. I followed the rest of the recipe and it was the best I had ever made. So this is another go to recipe in my recipe collection. I really have a lot of “Mel” recipes in that collection, I mean more than any other source. Thanks again. Mmm, this was delicious! Also not a mushroom fan here so I took suggestions from other comments and subbed it for celery – it was great! Kept everything else exactly the same and made homemade rolls with it. This will definitely be made again! Made this meatless in the Instant Pot for dinner tonight. It was ready in 15 min. Warm and hearty on this damp January night. This recipe was delicious! I was pressed for time so I skipped the browning step and just put everything in the crock pot on high for 4 hours and it turned out great. Will definitely make this again! Thanks, Mel! Really loved the flavors will definitely make it again. The only negative I have is it came out way too thick, needed to add more chicken and beef broth to come to a more soup consistency. I too added two extra cups of broth. Came out perfect soup consistency. Have you ever made this in the Instapot? I just got one and I’m still experimenting with it…wondered if you would suggest any changes to the prep above for the Pot? We absolutely love the depth of flavors in this recipe. So glad you decided to share. Even my mushroom hating kids love it- they have no idea they’re in there! Always love adding something new to my soup collection. It was -16 here when we woke up today, and this was calling out to us to make again! Yes, it’s probably because a grain like barley will soak up excess liquid if it isn’t served right away (and will keep cooking in the warm broth as it cools). I would love to make this in my IP. Could you tell me what you would do to cook it in the pressure cooker? Hmmm, I haven’t tried it but, I’d guess about 12 minutes at high pressure. This was great, I was looking for a stew/soup when it turned cold here, & as the cook I wanted easy, but if stew was the main it had to be hearty enough to satisfy my meat & potatoes hubby. He likes barley so I gave it a go. It was great! Nice flavor, hearty, warm & easy. I might try faro next time, if I can slide that by hubby. I have a really old slow cooker which is not very big, and I think this recipe would not fit in it. Would this work cooking on the stove top in a dutch oven? Would the recipe change at all, and how about the cooking time? Thanks!! Sure, I think that would work. You won’t need to simmer for as long – maybe simmer, covered, for 1-2 hours and see? I haven’t tried it so I’m not sure. You could bake it in a covered dutch oven at 250 degrees for six hours or so and see how that goes. I love love this recipe and I’m super picky about flavor. Even my “soup hating husband” loves it. Wondering if anyone has tried making this just throwing everything in the slow cooker without sautéing or browning? This is my second time making this recipe and it’s a huge kit. Definitely doesn’t taste like a “typical” crock pot meal. For some reason my grocery store never has barley, so I sub Italian Faro with great results. Sometimes I use stew meat or sometimes I cut up a chuck roast, depending what I have on hand. I also like to throw in a beef soup bone for extra depth of flavor. I agree with the previous poster who said it tastes like pot roast. This is going into my regular rotation for now on. Thanks again Mel! Hi Mel!! This soup looks delish! I can’t wait to make it this weekend! One question-do you think it would freeze well?? It freezes pretty well! The barley is slightly softer when reheating but I think it still works. Oh my heavens, this is amazing. I just took a taste from the crockpot to see how it turned out, and I almost couldn’t stop eating by the spoonful from the pot. It is SO good. Perfect flavors, texture, and richness. I did low for just over 5 hours before turning mine off (not on “keep warm” which seems to really keep cooking it). I did cut my meat into small chunks because I didn’t want to re-cut later for my small kids. So that will help it cook and be tender sooner. I have cooked dozens of Mel recipes, and this is going to be near the top of “perfection” from my Mel list. I made this for dinner the other day. The only modification I made was used only 4 cups of beef broth, no chicken broth because I wanted it more like a thick stew instead of a soup. It was so good and everyone loved it. I was wondering if anyone has frozen this recipe? What did it turn out like? I need to use up some stew meat that’s in the fridge right now but we have dinner plans tomorrow and I don’t know when we would get around to enjoying it. It looks so tasty and perfect for a rainy day. Made this today and had it for dinner. AHHHMAZING. Bam! Simply delicious and so easy! I’ve never had a whole lot of luck with my slow cooker. None of the flavours seem to turn out quite right. But I got desperate the other day – the cold weather has been moving in, I was craving something hearty, I had to work in the afternoon and I had beef in the freezer and barley in the pantry. Cue me googling beef and barley soup recipes and finding my way here. Mel, this recipe is fabulous! The flavours are wonderful, the beef melted in my mouth and it was delicious and warming, just what I needed. This is by far the most delicious thing that has ever come out of my slow cooker. I am thoroughly looking forward to perusing the rest of the site for more of your fantastic recipes! Thanks Sally! So happy you loved this one. I agree the slow cooker can be hit and miss; it’s always fun and refreshing to stumble upon a slow cooker keeper! Hi. I am new to your blog, and absolutely love it. Because of you, I am making this recipe for the second time in 5 days, and I have given up the recipe I had previously used for Beef Barley Soup for more than 20 years. Delicious! So glad you love this soup, Karen – thanks for letting me know! I left out the mushrooms and added 2 stalks of chopped celery to add some more veggies. Thanks for sharing!!!! I will definitely be making this again! Mel, I need you to know how thankful I am for this recipe! Seriously, every. single. time. I make it, I wonder why I don’t just make it every night LOL… But really, thank you because both my family and I really LOVE it! I just made this and I have to say. It was great!!! So much so that when I finished it I made another pot. Do I need to cook the barley before I add it, or just dump it in? No, you do not need to cook the barley beforehand. First off, I love your site! Second, I’m going to make this soon and I’m trying to decide if I want to add potatoes (I’m thinking a couple red potatoes), do you think I would have to change any quantities or do you have any other suggestions? If it’s just a couple potatoes you are throwing in, I’d leave everything else as is. Good luck! I’ve never cooked with chicken hearts so you’ll have to experiment. Good luck! Loved this. I used 4 cups of beef broth and two cups chicken broth. I’ve made your Key Lime Bars and Blondies, and they were great, too. Can’t wait to try more of your recipes. Thanks for sharing. I am a great cook and tend to stick with America’s Test Kitchen recipes. But, I read yours and it had the components tha ATK uses to increase “meaty” flavor (soy sauce, mushrooms, chicken and Beef broth and tomato paste). 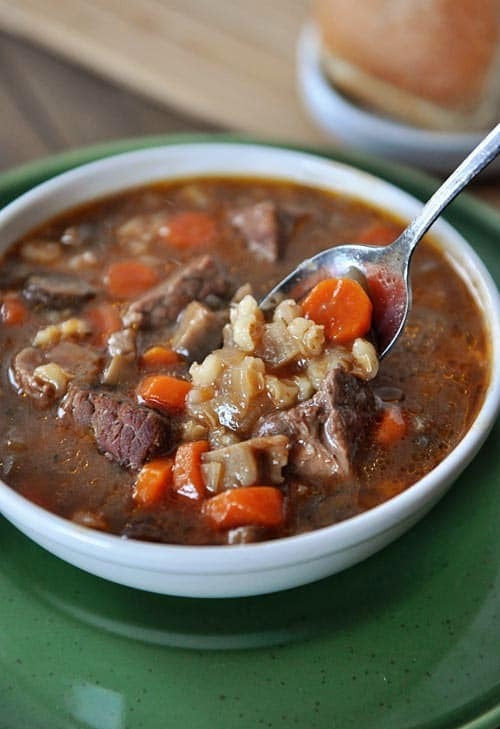 I have never found a Beef Barley soup recipe that is out standing and this one is. 🙂 I did discover by checking on internet that barley should be fresh and not out of date. I like barley to get plump but not explode and this did the trick. To answer a earlier comment about length of time needed to cook, I ate mine 3/4 way on low and meat was not nearly as tender after it finished the time called for. Thank you for adding a new favorite to my collection. Wow! We just made this yesterday. We left out mushrooms and added celery. At the end, we added a bit more salt and pepper. (That need could be due to our choice of broths.) Wow. The broth is flavourful and velvety! The meat was fantastic! This recipe now replaces the beef and barley soup we’ve been making for the past 15 years. My family is battling so many things right now…health wise to financial! I wanted to cook something that was comforting to all so I used the recipe as my guide. This soup is comforting and easy to make, and everyone cleaned their bowls… A rarity, seriously. Thanks so much for a great recipe. Hi Kim – sorry to hear you are having some challenges right now. Food can be comforting in so many ways and I’m glad this fit the bill. Hang in there! This was fantastic and the whole family gobbled it up. I bought “stew meat” from the grocery store (not sure what cut of meat that is….) that was already cut into pieces and it turned out tender and wonderful. This is in my slow cooker right this minute and I’m tryin’ hard not to snitch some before dinner. I think, toward the end of cooking I might put in some froz. peas for color. My daughter requested corn muffins to go along with these, and I thought that sounded like a great duo. Perfect meal for a very unspring-like day here in Michigan. I am a big fan of cooking joints of meat in my slow cooker as they come out so tender. But soups and stews I have avoided as whenever I have tried they have turned out watery and thin. However your photo and description sounds tempting enough that I will give it another try. I really enjoyed this recipe. It is a more hearty soup and my husband said it filled him up nicely. I also tried the fruit salad which was a big hit with the family unless you were age 10 and under. I didn’t have time to make the crescent rolls so I made Rhodes rolls instead and they went well with the meal. I enjoyed the “what to serve with this” feature. I hope to see more of it in the future. Made this today Mel and it’s so so good! I got started late and left it on high for 5 hours and it’s perfect! Thanks for the post, I will have yummy leftovers for days! I was afraid the carrots would be beyond mushy but they are good. May put them in a bit later in the recipe next time though, I like them on the firmer side. A real winner! Thanks so much! I made this soup on Sunday but I did it on the stove top since I got started so late. It simmered for 2 hours and it was TO.DIE.FOR. I have a culinary crush on you Mel. We are eating the leftovers tonight. I will be licking the bowl. I am not ashamed. I’ve copied it all into a text file, but cut it in half, as there are only the two of us and my slow cooker won’t hold 6 cups of liquid; 4 cups with meat and veggies will fill it to the very top! I have my eye on a new larger Cuisinart that will sear meat and steam things in addition to being a slow cooker, but it won’t be here any time soon! A half recipe is enough for dinner and lunch the next day, or some for the freezer. I’m going to make my own tomato paste from my dehydrated fresh tomatoes that I turned into tomato powder. I have a cool recipe for different forms of tomato from it, from paste to soup. I love beef and barley; I put barley in my vegetable beef soup. Always have, always will. I’m glad to have another version and I know it will be good because it came from you! Thanks, Mel! Mel.Made this soup today. It’s delicious. I did not do in the crockpot but cooked it stovetop for about 5 hrs. The meat was so tender. Used sirloin. I will definitely make again but double next time. Thanks for sharing a fabulous recipe. I made this tonight and it was really good!! The grocery store was out of thyme and for some reason I haven’t been able to find it lately but it was great without it! I used white mushrooms because that is what I had, I am not the biggest fan of mushroom but my husband loves them! It was like a pot roast in bite sized pieces, so good!!! I made them with your cheddar and herb drop biscuits because I forgot to make rolls. Thanks for the recipe! Dude, it’s beef and barley. You never question that. I’m glad you posted, this is a different version than my regular and I’m excited to try it. If I didn’t have the crockpot during baseball season we would all die from French fry poisoning. We spend too many hours at the ballpark. I am in love with the new side dish feature!! Just wanted to let you know that I’ve been following you from Tennessee and I wish you warm, springtime weather and temps soon! And you recipes are yum-yum! Keep up the good work! Delicious! First time I ever had Beef Barley Soup and I am so glad it was your recipe. My husband stated, “I hope you plan on making this often”. You do only post the best of the best. So very tasty. Love all the new features and I am having so much fun exploring the new side dish menus. I can’t see the weekly menu plan-it is blank! Hi Maureen – it was probably getting updated. I can see it now. Can you? I see this recipe calls for beef and chicken broth… what can I use instead of chicken broth? You can use more beef broth or vegetable broth. Beef Barley soup is a staple in our house . . . except it comes from Mel’s Diner (a little coffee shop a couple of blocks away)! I have tried to make the soup, but it never tastes as good as Mel’s. If my husband finds out that Mel’s has barley soup, he brings home extra. When our daughter was young, he would walk in the door and loudly announce, “Barley Alert!” A bedroom door would slam, feet would pound quickly down the stairs, and within seconds, our daughter was sitting at the table, spoon in bowl, the book, Ella Enchanted, open. She would make one bowl of barley soup last for an hour (or longer . . . thank goodness for the microwave) as she slowly sipped and chewed one barley at a time. Over the years, the pattern never deviated. Our daughter is now nearly finished with her Master’s degree, she still has Ella Enchanted memorized (yes, memorized . . . you should quiz her! ), and she has tried recipe after recipe, trying to find the answer to Mel’s Cafe’s beef barley soup. I am going to try your recipe and hopefully tell her that I have completed the search and that the answer came from another Mel who runs my favorite online cafe! Terry – your account of your family’s love of beef barley soup is adorable. Seriously adorable. I hope this is The One! Made this today. Even followed the recipe for once – at least mostly – a little heavier on the meat, onion and garlic. “Beyond Delicious” was my wife’s response. Mel is simply consistently great. The barley aspect of the beer combined with the barley in the soup, IN OBVIOUS ADDITION to what the marinade did to the meat, will no doubt produce groans of delight. I’m so excited for your side dish suggestions!!! Thank you!! You are truly an angel of the kitchen. My family knows that if I have made something delicious, it is probably your recipe. Can’t wait to add this to the my slow cooker repertoire! Thank you for all your help with meal planning! Mel, this looks so delicious! Can’t wait to make it! Thank you so much for the awesome new features. You are amazing! You are a one and only, Mel, no one can do this better than you! 🙂 Have a wonderful weekend with your sweet family! I hope Spring starts peeking out from under the snow soon! We love beef and barley soup! Thanks so much!! I understand you said to use regular barley, I just looked and have the quick type. Should I just add it later, maybe with 2 hrs. left to go? Does the quick type get soggy in the crockpot? Thanks for any help! Looks so comforting and yummy! Love beef and barley soup!! And I love the side dish suggestions!!! I will definitely be using those! Thank you so much for giving us side suggestions!! That is the number one area where I struggle the most. I am also loving your side dish planner. You are the BEST!! Also, this soup sounds super yummy! I absolutely love your blog and it is my first stop when meal planning on Saturdays for the coming week. Slow cooker recipes are the best with two busy boys and sports happening. Keep them coming!!! Awesome additions to your blog! Thanks Mel! You are the best! After buying a new crockpot, because my 20-year old round one just seemed out of date, and I really wanted an oval-shaped, larger capacity one, I’m realizing that not all crockpots “slow cook”. Even the “keep warm” feature on my new one is hot enough to boil broth. Which leads to lots of unhappy moments eating tough meat and dry chicken. Luckily I still have my old one, but for those experiencing trouble with tough meat in their slow cookers, I’m guessing it’s because the temperature is really high. Maybe this is intuitive, but if I don’t have 7-9 hours to cook on low, can I crank it up to high and cook 3-5 hours? Will this work with the barley? Julie – I haven’t tried it that way – there’s a chance the meat may not be quite as tender. You can definitely experiment with it. My mom makes a great a beef and barley soup. We refer to her recipe as “temple soup” now. She was I charge of making lunch for president Hinkley and the other visiting general authorities for the Billings temple dedication. She served her beef and barley soup. She said everyone loved it. I say if beef and barley is good enough for the prophet, it’s good enough for us. 🙂 I have to say that I like that this one can be made in the slow cooker. I’m glad that we still have some cold days ahead so I can try it! 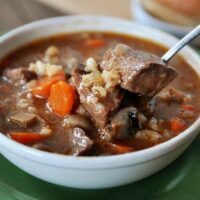 I am very grateful you posted this recipe, beef barley is always a winner. Thanks Mel for sharing and for sharing and organizing the meal planning for so many of us. You’re the Best! Mel, you’re just awesome. I love the new features and especially love the side dish planner you recently rolled out. It helps to remind me that I at least have to plan these things a little bit or we won’t have anything to eat with our meals! Love your blog and the every recipe I’ve ever tried. All of is other bloggers just need to quit because you have got this down! Beef and Barley is one of my all time favorite soups. So comforting. Thanks for sharing. I love your blog. Have you considered putting a serving size with number of calories per serving? Hi Deb – I won’t be adding nutritional/calorie info in the foreseeable future but there are several online calculators that can help if you google! It would be way to hard to add nutritional info without knowing what specific brand of ingredients the cook is using. Using REAL ingredients, like cream cheese and half and half and whatnot makes these recipes a bit more caloric, but real for is better. Also, I know when I look at your recipes that you are generally feeding an army of children and a husband so I know I will have leftovers at my house – and that’s a good thing (as Martha would say). 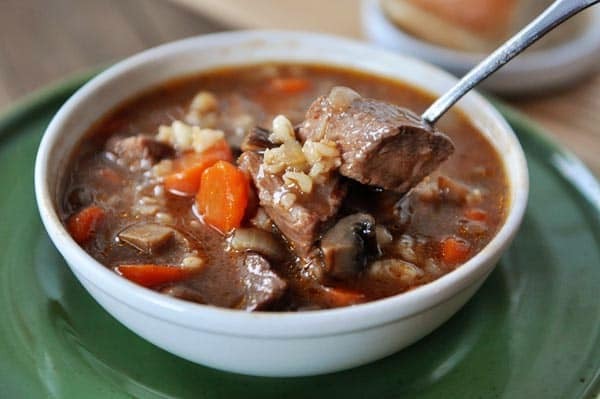 It’s hard to take pretty pictures of beef and barley soup, but yours looks so delicious and inviting. And sprinkles are fun, but this is the kind of food we love to eat most of the time. Can’t wait to try it in the crock pot! What can I use in place of the Barley (I know, I know, it’s part of the recipe). Janet Bradley – hmmm, you could try rice but the cooking time will be different (I think it would get mushy that long in the slow cooker) so maybe you could stir cooked rice in at the end or add it halfway through? Just a guess. I love barley in soup. I make a chicken and barley soup. This looks good but I would have to omit the mushrooms. Love beef barley soup, but I’m finicky about the chunks of meat (i know…weird eh!) Any time I’ve done something that has stew meat in it…the family feared for their lives , as it was more like eating heavy boots. I follow directions, but have yet to make a decent roast beef dinner, or stew / soup that didn’t require a hacksaw to get through the meat. If I was to use some good ground beef in place of it…would I brown it first then proceed as you have……..or would it even work? When you use the meat in yours…does it get super tender…like better then ground meat? My first try will be like you’ve done, but I’m just looking for a back up plan, because girl, that bowl of soup looks freakin’ amazing. Debora Cadene – yes, the beef in this slow cooker is melt-in-your-mouth tender. Of course, it depends a little on the type of meat you use but most beef cooks up pretty tender that long in a slow cooker. I would suggest using the type of meat in the recipe vs. ground beef, but that’s just a personal opinion. Good luck if you try it! I totally understand the fear of hacksaw-texture beef but I think you’ll be pleased with how tender this beef turns out. Debbie doesn’t your husband ever wonder why his boots keep winding up missing? I love beef barley soup, and the fact that this one is made in the slow cooker makes it a winner in my book! I love the new features, Mel! Without these nutritional, tasty main dishes, I would have very little interest in your site for recipes. Family nutrition comes first and foremost with carb laden (yesterday’s ciabatta type rolls are calling my name LOUDLY), and sweet treats used as accents of love from mom. And even though this soup recipe will not get “997 Facebook shares” as your recently posted banana bread recipe received, we need the “uprightness” of these kind of recipes in our life for our families. Excited to try this soup soon.